It was a crisp 102 here today and couple that with awesome Ohio humidity and you pretty much have my worst nightmare. My blinds and curtains have been for closed 72 hours straight and I’m starting to feel very hermit-esque. While I was taking care of some random stuff around the house, Brian quickly sensed my foul mood and offered to cook dinner. He actually stood outside and fully embraced the insanity to cook himself a steak – I opted for watermelon and this super simple Roasted Garlic and Tomato Bruschetta. Although I am a self-professed tomato hater, I actually really like this little appetizer, although I’ll admit to pushing a few of the maters off to the side. 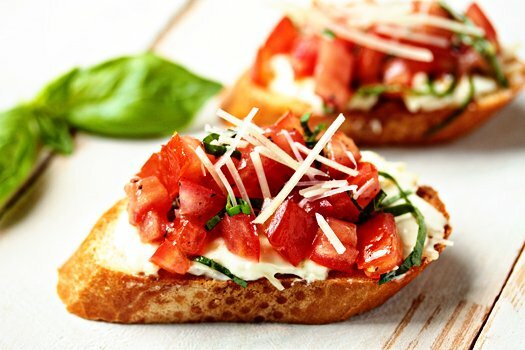 This bruschetta is not only extremely flavorful, but it’s also the perfect little snack or appetizer for those lazy summer nights. Toasted pieces of baguette create the perfect canvas for a rich and creamy layer of roasted garlic cream cheese spread. Top that off with a mixture of tomatoes and basil for a burst of freshness. Tip: Since I am anti-oven right now, I roasted the garlic and toasted my baguette in my toaster oven and it turned out perfectly. I hope you enjoy this recipe as much as we do. Have great weekend and stay cool. Cut the top 1/3 off of the garlic head, exposing cloves. Place on foil; drizzle 1 teaspoon olive oil over the head of garlic and sprinkle with a dash of salt and pepper. Wrap with foil. Bake in preheated oven 1 hour or until tender. Let cool. Meanwhile, combine tomato, basil, 2 teaspoons olive oil, salt and pepper to taste in medium bowl; set aside. This is a sponsored post for Sargento, all opinions are my own. Mmm, I love bruschetta and this looks delicious. So perfect for hot evenings. I’m going to try your roasted garlic cream cheese spread with my brsuchetta next time, it sounds great! Jamie! Pushing tomatoes off to the side is what my picky husband does! Nooooooo…. omg i’m in Ohio too! i had to wait until 10 pm to go running and i still felt like i was running in a sauna!! miserable. on the bright side, the food looks great! This sounds perfect for a dinner party. The cream cheese sounds amazing! Perfect dinner for a hot night. Don’t waste those tomatoes! Try this one out too…my kids HATE tomatoes and LOVE this recipe…often they eat it for dinner!! Spread on slices of French bread or baguettes. Spoon mixture on top of bread slices and bake at 400 for 10 minutes!! Mmm, my favorite thing to munch on before dinner! Lovely. I’m a huge bruschetta fan and would adore a plate of this right now (yes, even though it’s not even 10AM!). sounds like a really good recipe. Bookmarked! Oooh, yum! 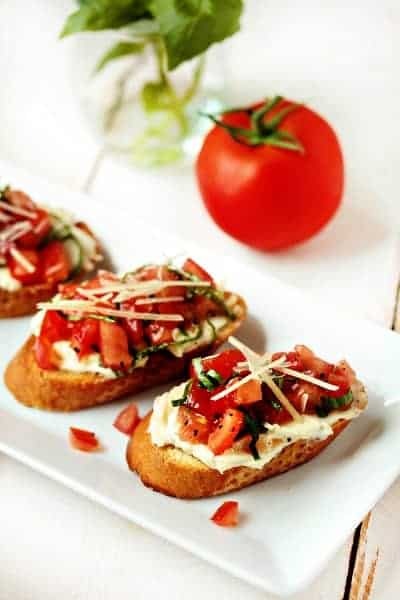 Love this bruschetta… I want this for lunch tomorrow! Those look (and sound) delicious! Also, I feel your pain on the heat and humidity lately. I’m in Toronto, and last week it was nearly 50 degrees with humidex. And I don’t have AC. And I live on the third floor of a house. Needless to say, it was pretty unbearable. My apartment was hotter than it was outside! Sounds delicious! Great idea roasting the garlic in the toaster oven; I’ll have to remember that!! This bruchetto is absolutely scrumciolicious.. 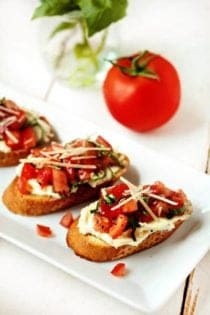 I made this bruschetta for my family… It’s so delicious!! Not too hard and worth every step. Definitely recommend! I’m so glad you liked it, Arielle!